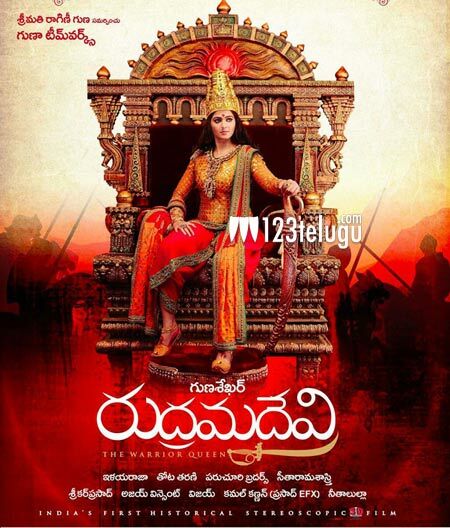 Gunasekhar’s upcoming film Rudhramadevi is currently underway in a specially erected set in Saradhi Studios Hyderabad. Some crucial scenes in the backdrop of British empire are being shot on the lead cast in this set. The film’s male lead, Rana Daggubati has already wrapped up his part recently. Anushka is playing the title role in this film, which also features stylish star Allu Arjun as Gona Gannareddy. This film also features Prakash Raj, Krishnam Raju, Catherine, Nithya Menon and Hamsa Nandini in other prominent roles. Maestro Ilayaraja is scoring music for this project while Thota Tharani is the art director.